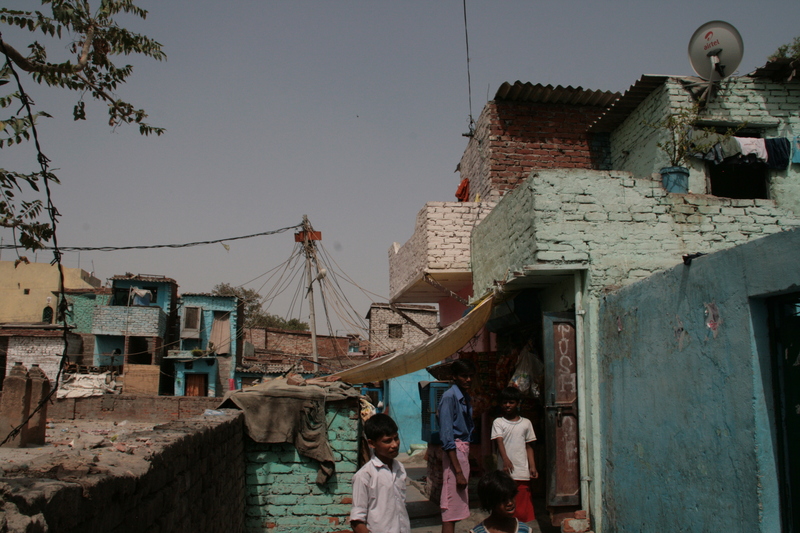 My time in India was a harsh reminder of the problem of extremes of income ineq uality. Of course this topic is a political hot button – especially here in the US around election time. The issue in India feels less political, however, and more in the realm of basic human rights and dignity. The topic was brought into sharp focus on my first day. Dell hosted our event at the new Leela Palace in Delhi. 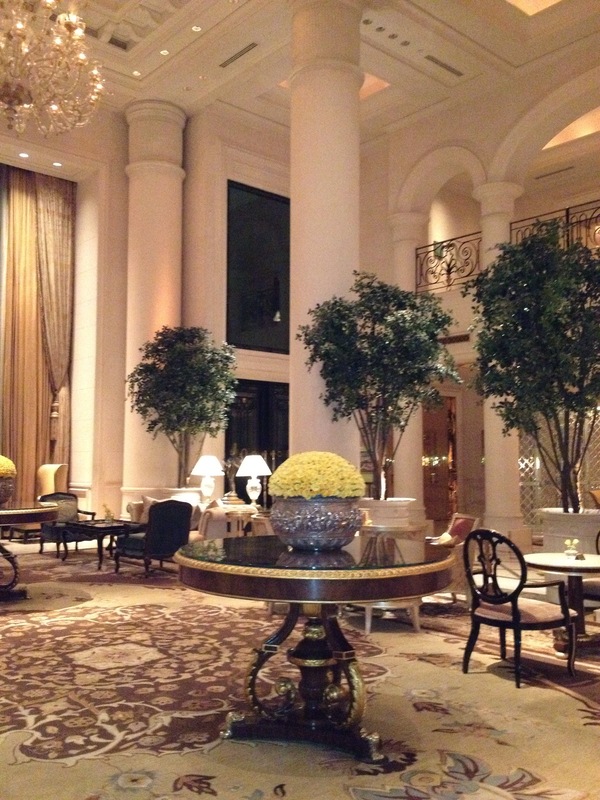 It is safe to say that this was the most opulent hotel I have ever stayed in. This view of the lobby is an example. The Leela family clearly believe the adage that nothing succeeds like excess – there is a glorious excess of flowers, service, marble, gilt – you name it, they have it. Our first afternoon I elected to join an optional program where we went with the president of Save the Children to learn about the mobile health program they operate in the slums. 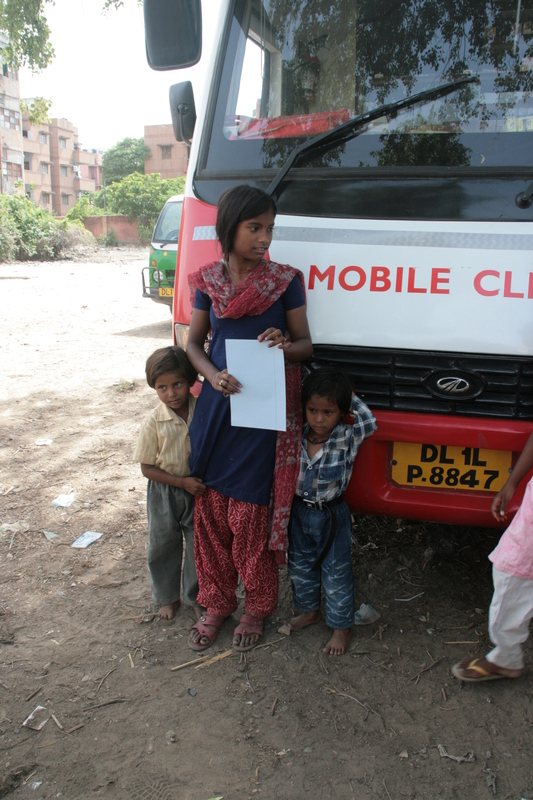 They operate this program in the poorest slums of Delhi (and other cities) where people have the least access to health care. We saw two programs that are part of Save the Children’s mission. 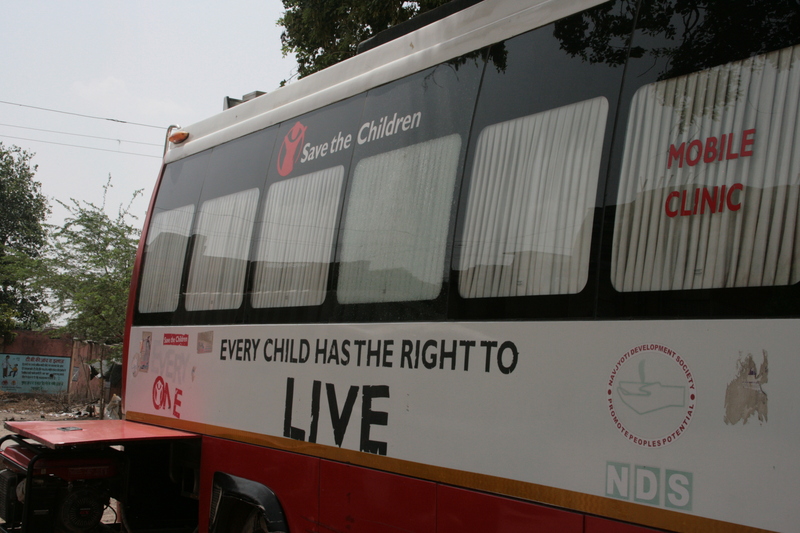 One is a mobile health van – literally a large van that goes to places without other medical care – on board are a doctor, pharmacist and nurses. There is a mini lab as well as exam room. They also run educational programs where they “train the trainer” – children and adults t o educate peers about sanitation, nutrition etc. The slum where these programs were taking place made the Favelas I had visited in Brazil during the 90’s look like luxury condos. Sanitation was poor – a single non-functional latrine for an entire neighborhood. Water was not safe to drink. I’m sure the vast majority of the illnesses being treated stemmed from the poor water and sanitary conditions. According to Save the Children, 50% of children in India suffer from malnutrition. Look at the two children in this picture – these children appear to be 2 and 3 – they are 5 and 7. And they don’t catch up – this degree of malnutrition will handicap these children and the society that needs to support them – for life. Save the Children has a pragmatic program – focus on exclusive breastfeeding for the first 6 months and food supplementation programs for the first 3 years. That is the most leveraged use of their resources and I admire their pragmatism. It is hard for them to have to allocate their resources so carefully – after all proper nutrition for children of all ages should be viewed as a basic human right. 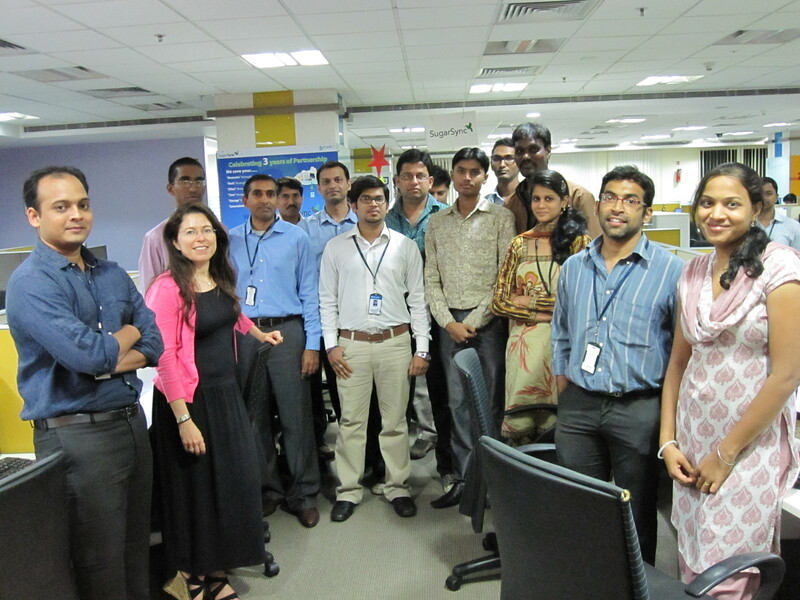 We hear about the growth in the Indian economy – all of the brilliant software engineers, outsourcing companies etc. India is actually a net food exporter so malnutrition today (unlike 30 years ago) is not a lack of food but of money. Inequality in earnings has doubled in India over the last two decades, making it the worst performer on this count of all emerging economies. The top 10% of wage earners now make 12 times more than the bottom 10%, up from a ratio of six in the 1990s. By contrast In Brazil, household incomes have been growing faster among the poorest households than among the richest for the last two decades. India spends less than 5% of its GDP on social welfare as compared to Brazil’s more than 15%. Its tax revenue as a proportion of GDP is under 20%—the lowest of all emerging economies, and just half that of developed countries. This is not the path towards improvement. There are bright spots. My visit to Hyderabad was exciting – a high-tech oasis in the midst of all of this. Many busy office towers, thousands of educated, bright engineers and business people working on cool technology. But I question if things are structured for these bright spots to pull up the laggards in the economy. There is a growing middle class – about 5% of the economy in 2007 according to McKinsey and Co but the poverty is overwhelming. Apologies in advance to readers if this is too much of a rant. I think it is probably for the best that I left my internship at Agency for International Development (A.I.D.) in Washington in 1986 to go to business school – I would be ranting every day if I worked full time in the development economics field knowing these realities. On the other hand technology companies such as SugarSync can be part of the solution. We employ 30 people which has its own small multiplier effect. 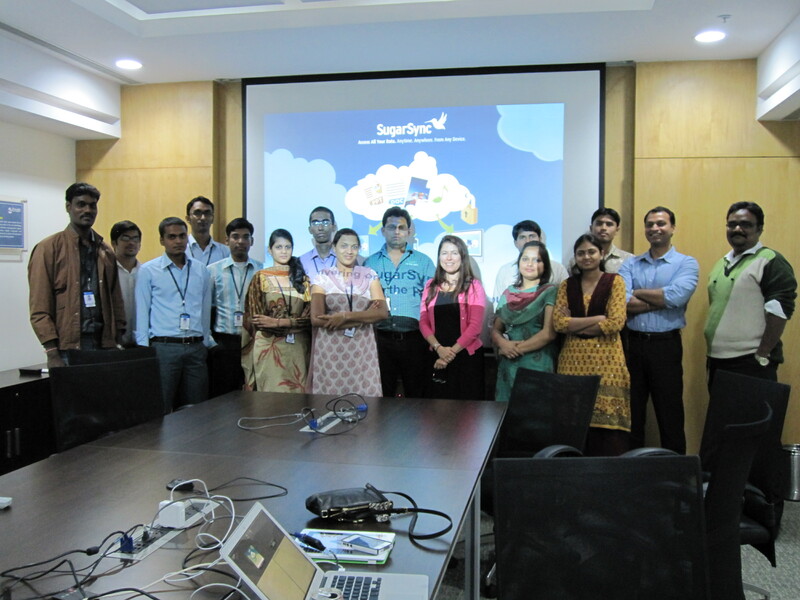 It was exciting to do a training program for the team and see their excitement about our software and working with our customers. I’m looking forward to going back for a more extended trip to learn more about the business climate and other parts of the country. This entry was posted in Travel and tagged Brazil, India, McKinsey & Company by lyecies. Bookmark the permalink.